We show that the full matrix algebra Mat p(ℂ) is a U-module algebra for U = Ū q sℓ(2), a quantum sℓ(2) group at the 2pth root of unity. The algebra Mat p(ℂ) decomposes into a direct sum of projective U-modules P n + with all odd n, 1 ≤ n ≤ p. In terms of generators and relations, this U-module algebra is described as the algebra of q-differential operators “in one variable” with the relations ∂z = q − q −1 + q −2 z∂ and zp = ∂p = 0. These relations define a “parafermionic” statistics that generalizes the fermionic commutation relations. 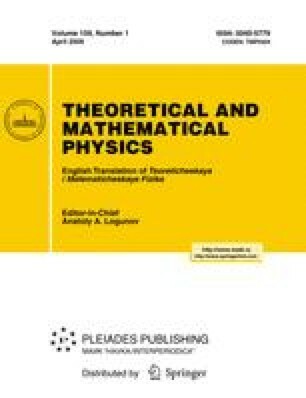 By the Kazhdan-Lusztig duality, it is to be realized in a manifestly quantum-group-symmetric description of (p, 1) logarithmic conformal field models. We extend the Kazhdan-Lusztig duality between U and the (p, 1) logarithmic models by constructing a quantum de Rham complex of the new U-module algebra and discussing its field theory counterpart. Prepared from an English manuscript submitted by the author; for the Russian version, see Teoreticheskaya i Matematicheskaya Fizika, Vol. 159, No. 1, pp. 5–33, April, 2009.